There are a lot of benefits of dates; however the most important are anemia, intestinal problems, sexual dysfunction, cancer and diarrhea etc. Dates also help you to gain healthy weight. Dates are rich in minerals, vitamins and fiber. It contains phosphorous, iron, sulfur, copper, magnesium which are very advantageous for a good health. You might have heard that eating one date daily will cover your balance diet and will keep you healthy. For muscle development eating dates is very necessary. People eat dates with several ways like some eat directly while some mix them with milk and make paste of it. The paste is good fast recovery of injury. According to a new research dates also help in preventing of abdominal cancer. Moreover, it is also good for improving nervous system as they have plenty amount of potassium. Dates has tremendous amount of minerals and vitamins, while it is a good source of fiber, sugar and energy. Some necessary minerals such as phosphorus, calcium, potassium, zinc and magnesium are found in dates. They also have some vitamins like folate, riboflavin, vitamin A, thiamin and vitamin K, etc. The minerals that is found in the dates make dates the most distinguished food and strengthen your bones. Besides, dates can fight against the disease like osteoporosis. It also contains manganese, magnesium, selenium and copper that are very beneficial for your healthy bones and make your bones stronger and good for aged people whose bones gradually weaken. So, to give boost to your bones eat dates. Intestine contains some beneficial or friendly bacteria; regular intake or dates will give growth to those friendly bacteria that will improve digestion system. In the same way it also contains amino acids that boost the digestion system that means that many nutrients will be absorbed through the digestive area and will use in your body properly. Dates have high quantity of minerals that are beneficial for numerous health disorders; e.g. the extraordinary amount of iron is good for those people who are suffering from anemia. The high amount of iron increases energy level and gets rid of sluggishness and fatigue. One of the best benefits of dates is the decreasing of allergic reaction of regular allergies. Since dates contains sulfur that helps to reduce the allergic reactions. Some other benefits of dates is it contain proteins, sugar and many other important vitamins that help to increase weight. If dates are used with cucumber paste, it will you keep your weight normal rather than over-slimming or over-weighting. The nutrients included in the dates can cover your daily requirement of diet. 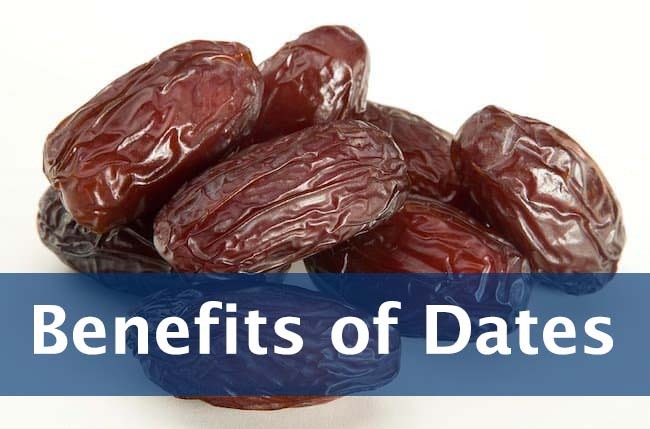 Apart from the discussed benefits of dates, it also include organic sucrose, sugars and fructose, so it is a perfect source of energy and to kill hunger. A lot of people eat dates as afternoon snack when they are feeling lethargic or sluggish. When you are at gym and feel tired after a huge workout, eating a few dates will help you to recover your energy back. The huge amount of vitamins in dates boosts your nervous system. Since, it contains potassium that helps you to make your nervous system more healthy and responsive. So, to keep your memory sharp dates is one the best sources. When dates are soaked overnight and crushed in the morning, it gives tremendous boost to weak heart. Since, it has plenty of potassium, so it helps you to reduce a lot of heart diseases. Besides, it reduces cholesterol level. In short, when dates are taken twice a day, it helps make better the overall condition of your heart. One of the benefits of dates is to get rid of night blindness. If you are suffering from night blindness, date is the perfect remedy to reduce the night blindness as it has been proven by research.